Posted by janina on February 7, 2009 at 11:05 am. 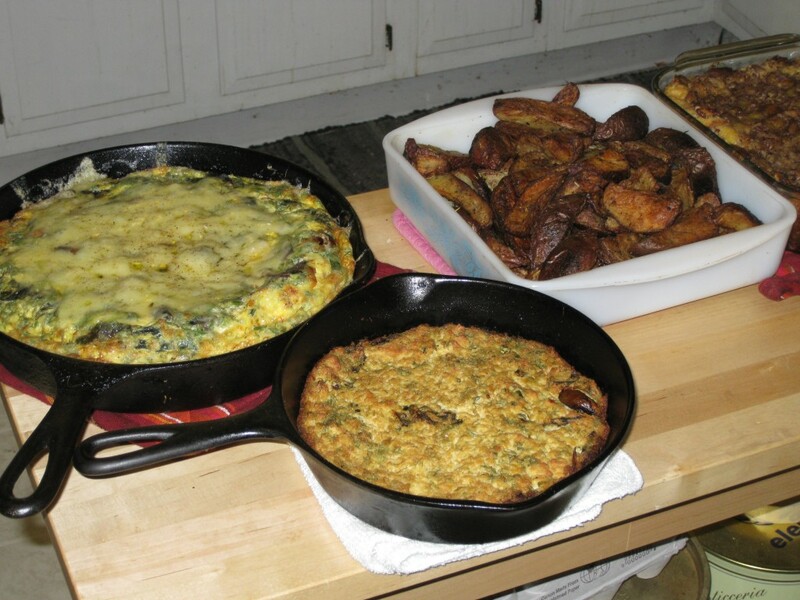 There are a lot of cooking variations for frittatas, many of them over complicated. This seems to be a common trend for peasant dishes, and one I really don’t understand. To me, these sorts of dishes should be so simple that you can make them with anything you have lying around with no more than a couple steps.. then if you want to make them more complicated, you can. SO, here is a basic break down of how to make a frittata, with a slightly more detailed example of how you can spruce it up a little bit. based on the size of your iron skillet, break enough eggs (in a large bowl) to fill it about an inch to an an inch and a half and cut it with a bit of milk. For a full size skillet use about 12 eggs and 1 cup of milk. Whisk well (by hand or with a mixer) preheat your skillet on the stove with a decent amount of olive oil, 1-2 tablespoons. When your skillet is evenly hot (it should sizzle if you splash water in it, but not be so hot that the oil is receding) pour in the egg mixture and let it cook a couple of minutes. stick the skillet in the oven until evenly cooked (about 15 minutes), then top with cheese and place it the broiler for about 3-5 minutes (until the cheese is melted and beginning to brown). Pull it out and let it stand 5 minutes before serving. either early in the morning or the night before, roast some garlic by removing the outer skin layers of the garlic (so that each individual clove is still covered, but the bulb isn’t covered as a whole), drizzling it with olive oil, and baking until tender. Depending on how hot your oven or toaster oven is depends on the time you cook it for. I usually make it the night before in a toaster oven at 375 for about 20 minutes, but, if I’m cooking something else that morning I’ll sometimes just stick it in with whatever else I’m making. Once it’s cooled you can pinch off each clove and pop the roasted garlic out. wilt the beet leaves in a steamer or pan with a bit of water, drain excess liquid and set aside. 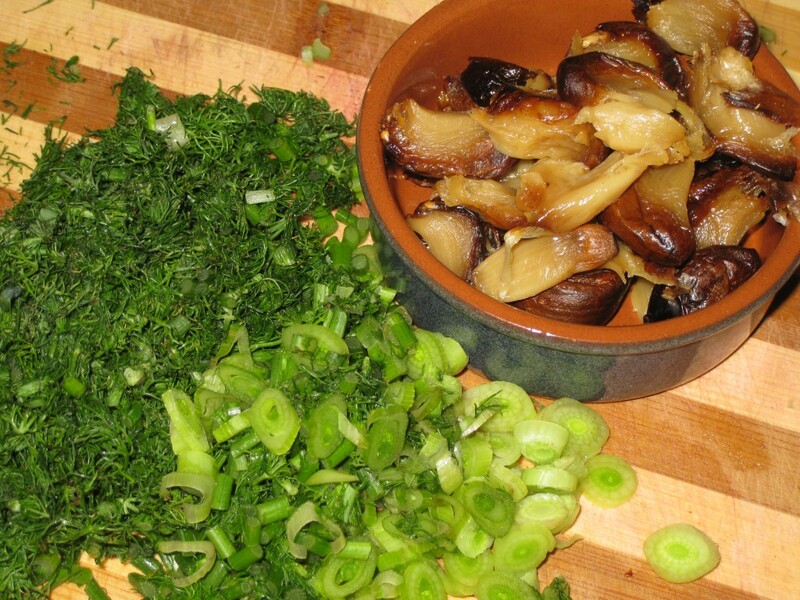 if you have a fennel bulb, caramelize the fennel bulb by chopping it into small, 1/4″ pieces and cooking it on low heat with a tablespoon of butter, a bit of olive oil and some salt. Remove from heat when it starts to brown. allow all ingredients to cool, then whisk them into your egg mixture before cooking. That’s really it, and don’t be afraid to use your leftovers! Everything is delicious when baked with eggs and cheese! I looked for a lot of recipes on rice porridge and came up empty. Apparently there is a tradtional Japanese rice porridge made with fish, and that definitely wasn’t what I wanted, and for some reason it never occured to me to look up “arroz con leche”, though that is most certainly what I was after. Looking now, I see that most of those recipes are too sweet, but they are a good starting point if you ever want to try something a little more traditional. Here is the recipe I finally settled on, though I admit I got lucky since I was pretty much winging it. in a heavy bottomed sauce pan cook rice and water on high heat until rice is tender. reduce heat to low and stir constantly until thick. The whole process takes about a half hour. Serve immediately or keep warm in a slow cooker on low. Top with a sprinkling of brown sugar and cinnamon, or soft yogurt.